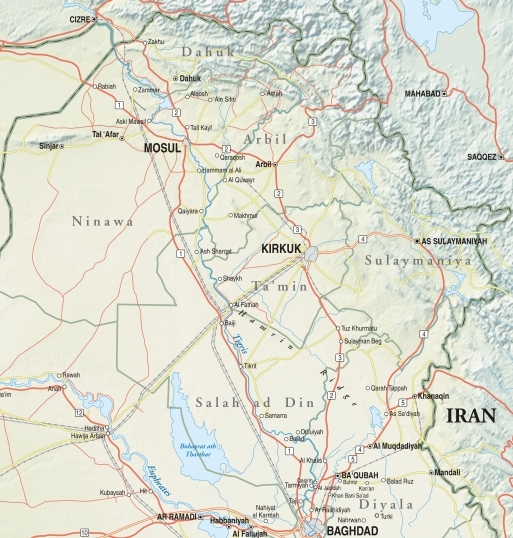 Northern Iraq extends north from Baghdad and is bordered by Syria, Turkey, and Iran. It consists of the provinces of Salah ad-Din, Diyala, Kirkuk, Sulaymaniyah, Arbil, Dahuk, and Ninawa. Iraqi Kurds inhabit the northern area, including Sulaymaniyah, Arbil, and Dahuk. The remainder of the region has a mix of ethnic and sectarian groups. The cities of the Tigris River Valley, stretching northward from Baghdad, are principally Sunni, whereas the Diyala River Valley stretching to the northeast has a mix of Sunni and Shi'a. There is also a significant Turkoman population in Mosul and a large Sunni Arab population in Kirkuk. The latter was settled in Kirkuk by Saddam Hussein and there has been continuing tension concerning their presence with their Kurds. As al-Qaeda in Iraq (AQI) was pushed out of Anbar to the west, Baghdad to the south, and Diyala to the east, they have taken up refuge in the rural Za'ab Triangle area formed by the Tigris and Za’ab rivers south of Mosul. They remain in small numbers in rural areas of Diyala province, including in the southern region of Balad Ruz, Salah ad-Din province, and Ninewa and Kirkuk Provinces where Arab-Kurd tensions feed AQI's sectarian aims. Elements of AQI have also been able to carry out attacks in Baghdad, though their capacity to do so long-term is questionable. The Kurdish region has remained stable since the fall of Saddam Hussein in 2003. However, the Kurdistan Workers Party (PKK), a terrorist organization that operates out of the mountainous region along the Turkey-Iraq border, has recently become increasingly belligerent. Due to an upsurge of cross-border attacks into Turkey during the fall of 2007, the Turkish Government has repeatedly warned of possible military action against the PKK in Iraq.